Posted on 10, October 2018 by FactMR | This entry was posted in Belgium, Business, Denmark, Economy, Financial, France, Germany, Healthcare, Iceland, Industrial, Internet & Online, Ireland, Italy, Netherlands, News, Norway, Poland, Sweden, Switzerland, Technology, United Kingdom and tagged Advanced Analytics, Agriculture Analytics, analytics, artificial-intelligence, BFSI analytics, Big Data, Cognitive Capability, Cognitive Computing, Cognitive Healthcare Solutions, Europe IBM Watson Services, Healthcare Analytics, IBM Watson API, IBM Watson for Oncology, IBM Watson Market Forecast, IBM Watson Market Study, IBM Watson Services, IBM Watson Services Market, IBM Watson Survey, IoT, Machine Learning. Bookmark the permalink. DUBLIN 2, Ireland, 10-Oct-2018 — /EuropaWire/ — IBM Watson Services continue to get significant traction from end-users, with over 72% respondents in Europe affirmative on using IBM Watson language services, according to a Fact.MR survey. The survey is part of the comprehensive research study on IBM Watson services market which tracks the adoption of this platform across key sectors. 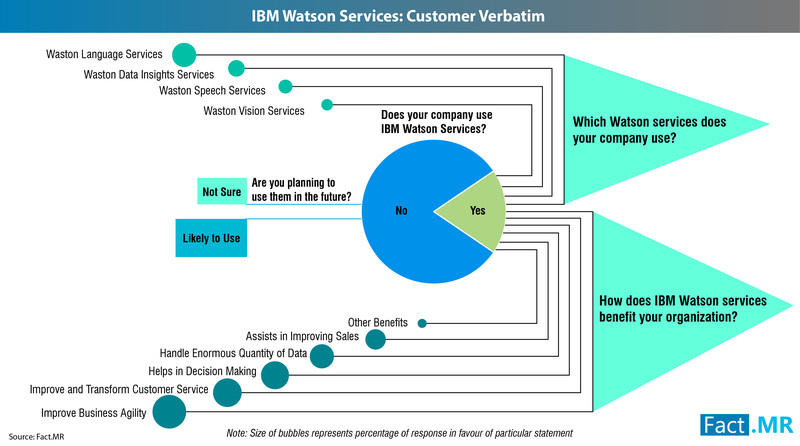 The Fact.MR survey also reveals that use of IBM Watson vision services attracted the minimum interest, with only 48% of respondents in Europe affirmative about using it.